I like yogurt. It’s delicious, quick, and filling! I primarily eat it as a snack but also use it in smoothies and even use plain yogurt as a substitute for sour cream. Yes, it can be done, and they taste strikingly similar on Mexican food. I’m always excited when I get to try a new yogurt product, and especially when I then get to share it with you. Just today, I tried my first cup of Yoplait’s new Fiber One yogurt in their “peach” flavor. Honestly, it was even creamier than a regular yogurt and I appreciate the added fiber and vitamins it contains. My only hesitation on this product is that it contains Aspartame which has been linked to serious neurological problems. I’d love to see them use real sugar in the product instead since my opinion is that a few extra calories is better than the myelon sheath of my neurons dissapearing. 😉 I’d love to try the Vanilla and Key Lime Pie flavors as well since I think they’d be great with the extra creamy taste, and also to see Yoplait add real fruit chunks! Yum. MyBlogSpark and Yoplait have teamed up to provide one of my readers with her own Fiber One gift bag that includes a Fiber One yogurt VIP coupon (good for a free 4-pack of Fiber One yogurt), and a $50 Safeway (also good at Dominick’s, Tom Thumb, Randalls, Vons, Genuardi’s) gift card that you can use to stock up on Fiber One yogurt and enjoy the everyday values that Safeway has to offer. To enter, tell me what other ways you try to get fiber into your diet. You must include an email address and separate comment for each entry. Contest will end 3/23/10 at 11:59, EST. I try to eat beans every day – I like making refried bean dip because it's tasty and it has fiber and protein. I tweeted today. 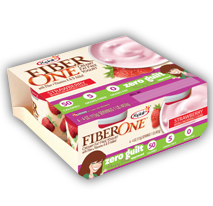 THANKS SO MUCH FOR THE EXTRA CHANCES TO WIN THIS SAFEWAY GIFT CARD AND FIBER ONE PRODUCTS! !